Lomonosov Moscow State University conducted research, about a psychological disorder that causes people to have trouble sleeping to 33 youths. They were promised to be given some money, with the condition that they should be fast asleep. The researchers found the results, raising the amount of money actually makes the study participants more difficult to sleep. Thus, shortening the total time of sleep and reduce their overall sleep quality. Robert Rosenberg, DO, (the medical director of the Sleep Disorders Center at Arizona) said, psycho-physiological insomnia is a real problem that affects about 15% of all patients with chronic insomnia. 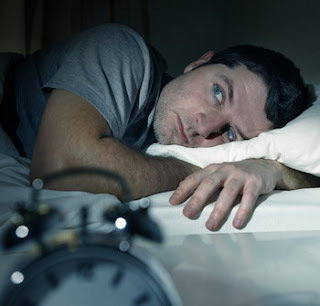 Many people have negative associations toward bedtime and their bedrooms (read insomnia symptoms post). This can lead to frustration, psycho-physiological insomnia is caused by anxiety due to chronic inability to fall or stay asleep. Anxiety is increasingly made patient can not sleep. If you feel you are experiencing psycho-physiological insomnia, there are some steps you can do to help bring sleepiness. Dr. Rosenberg suggests, you have to eliminate the negative thoughts and replace them with positive affirmations. For example, you always think that if within 30 minutes you have not slept, then all your activities will be broken tomorrow. It is the mind that is negative, it is recommended to be replaced with positive thoughts. For example, I've never had problems sleeping before, and can handle it, now surely I can too. In addition, do not go into the bedroom before you really sleepy, even if this means you have to delay bedtime. You could also try a way to consume snacks that contain complex carbohydrates with tryptophan, which can help bring sleepiness. Do not also constantly watching the clock, as this can increase the levels of anxiety and makes you more difficult to fall asleep. Avoid exercise before bed: Regular exercise is recommended. However, do not exercise before bedtime. If you often have difficulty sleeping, there should be no sports at 4 hours before bedtime. Many people think that exercise can go straight to bed. In fact, it could be restless and can not get to sleep. Wear comfortable clothes: Clothes also help a person sleep better. Wear comfy clothes, for example, are made from soft, not hot, loose, or too tight. Comfortable clothes help a person more easily initiate sleep while already lying on the mattress. Positive Thinking: Mind it can affect the quality of one's sleep. Do not stress or thinking to have trouble sleeping. Prayer and meditation before bed can make the mind relaxed so that sleep comes more easily. If you think you can not sleep, you will be hard to sleep. The more imposing sleep, the more difficult to sleep. If for an hour already lying down, but not yet asleep, preferably out of the room first. If you're feeling sleepy again, or tired, then back to the the bedroom. Create a comfortable room: Make the bedroom comfortable as possible. Should not be too many items in the room. Additionally, use the room just to sleep and activity of husband and wife. Do not use the room to work, or watching TV. It is ok to read a book with content that is not heavy, or can also listen to music that is slow and make relax.